Zion Market Research has published a new report titled “Luxury Cars Rental Market (Compact Luxury Cars, Mid-Size Luxury Cars, Full-Size Luxury Cars, Luxury Crossovers & Minivans, and Luxury SUVs) for end-users such as Local Usage, Airport Transport, Outstation, And Others: Global Industry Perspective, Comprehensive Analysis and Forecast, 2016 - 2022”. According to the report, the global luxury cars rental market accounted for USD 8.2 Billion in 2014 and is forecasted to surpass the USD 23.2 Billion by 2022, growing at a CAGR of around 14.0% between 2017 and 2022. Most car rental providers offer a range of vehicle sizes to suit a variety of budgets and space requirements. Some providers additionally offer specialized vehicles to suit its location such as convertibles, prestige models, hybrid/electric vehicles, or SUVs and passenger vans. The technological innovation such as Internet website allowing online reservations, the different mobile application allows user to save their time and money. The automotive industry can benefit from a fundamentally different business model, which involves less waste, higher customer loyalty, and significantly improved profits. To gain such types objective automaker has started adopting the different business model, instead of selling cars for a one-time profit, manufacturers have started to a service based long-term lease business model. Instead of losing touch with customers after the initial sale, manufacturers collecting back used vehicles years later to be remanufactured into new vehicles. These are examples of circular economy strategies, whereby manufacturers efficiently recycle and remanufacture their products without sacrificing quality. Ultimately, this leads to a more sustainable business model and environment. Circular economy strategies are helping luxury car rental firms to invest in the business. Such kind of circular economy strategies is supporting the luxury car rental business. Mercedes Benz is implementing these strategies and expected top profit gain is up to nine times within five years. Compact luxury cars segment is expected to dominate the luxury cars rental market over the forecast period among other luxury car type segments including midsize luxury cars, full-size luxury cars, luxury crossovers & minivans, and luxury SUVs. Compact luxury cars segment is expected to expand at a relatively high growth rate of 14.2% over the forecast period. Airport transport segment is expected to account for relatively high share with a significant growth rate of 14.4% over the forecast period. Others segments of the luxury cars rental market by end-users segmentation include local usage, outstation, and others. Online segment is expected to expand at a relatively high CAGR the offline segment over the forecast period, attributed to increasing trend of e-commerce across the globe. Online segment is expected to account for 70.2% by 2022 end. The luxury cars rental market is fragmented on the basis of the region as North America, Europe, Asia Pacific, Latin America, and the Middle East and Africa. Among the above-mentioned regions, Asia Pacific luxury cars rental market is expected to expand at a relatively high growth rate over the forecast period. However, luxury cars rental market in North America is expected to dominate the global market with 46.7% revenue share by 2022 end. 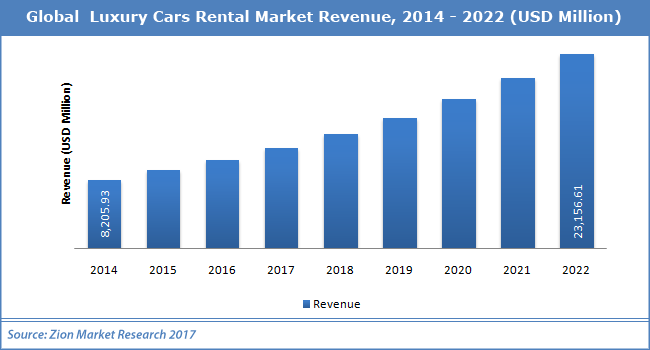 Prominent players of the luxury cars rental market include Avis Budget Group, Inc., Sixt Rent-A-Car, Enterprise Rent-A-Car, The Hertz Corporation, Europcar, Al-Futtaim Group, Carzonrent, Localiza Rent A Car, Eco Rent A Car, and others.